What a wonderful surprise I had recently when I received pictures from a happy customer! Annie had been interested in my color grown cotton fabrics and purchased the jersey in both tan and light green, as well as matching ribbing. Pictured above is one of Annie's finished garments, a light green tunic. I just love the graceful drape of Annie's creation. Thank you, Annie, for sharing these pictures with me and thanks for allowing me to share them with others. I know that many of my customers don't blog and don't post their makes on social media, so it's such a treat when I see what they've made. 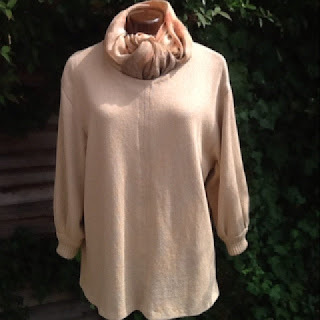 Below is Annie's tan tunic, a slightly different style, and just as lovely. Perhaps you've already seen the wonderful natural white jersey Shrug from Leila of Three Dresses Project? Quite some time ago Leila tweeted to the world how she was unable to find sweater knit fabric. 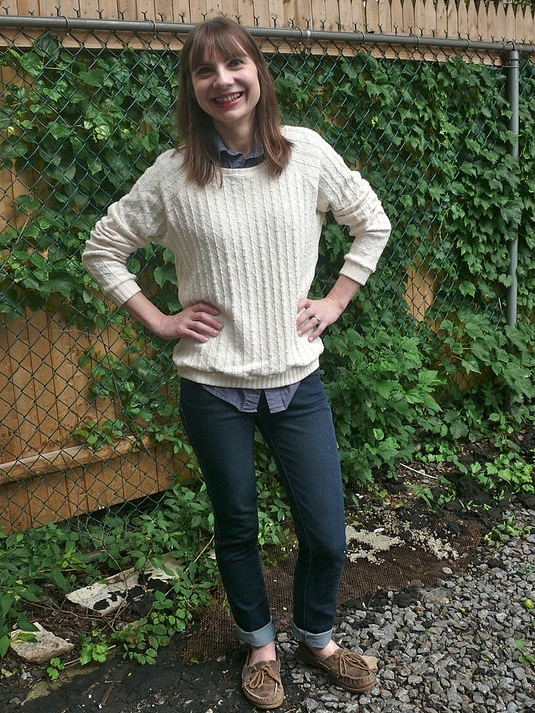 It was spring and there simply weren't any sweater knits available where she shopped. "Ah, someone who wants to sew sweater knits!" I said to myself. "I'll send you some, Leila," I emailed her. Returning to our topic... the yardage finally arrived at Leila's door, and she made the beautiful shrug cardigan. You can see in the pictures that although it's a jersey, it's heavier than standard jersey. It really is a true sweater knit. You can see more pics and read all about Leila's pretty wrap dress on her blog. Last I leave you with Grainline Studio's Linden by Sonya of GingerMakes. Sonja completed it way back at the beginning of summer, but I realized that though newsletter subscribers have certainly seen it and readers of GingerMakes have seen it, I don't think I ever posted a picture on Crafting Fashion! More about the sewing and the fabric are on the GingerMakes blog, in case you haven't read it already. I must admit that I love everything about this sweater. I think it's great that Sonya chose what's technically a sweatshirt pattern for the New Hudson fabric. It was a very good combo! I'm so excited about the 100% wool knits that will be arriving at the shop throughout October. There's a scrumptious wool, as soft and fine as Australian merino but from a wonderful sheep breed developed in the the US over a hundred years ago, the Columbia sheep. And there's a bulky textured fabric, knit with a medium grade American wool. This fabric will be perfect for wraps and ponchos and cardigans. Can hardly wait. They're coming soon! They are! So exciting to see sewers spend their time to make such lovely items with the fabric. I have the hardest time with sweater knits! They're either too thin to be useful as a dress or so bulky they don't have the right drape. I'm really looking forward to seeing your wool knits! I need something heavy enough to withstand the piercing Oklahoma winds (you know, the ones they sing about in that Broadway tune) while still having enough drape to handle Simplicity 2774. Eep! Wool knits!! So exciting!!!! !